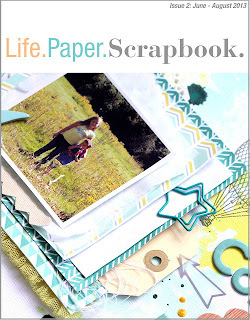 I am so excited/thrilled/ecstatic to announce that I have been chosen to design for Life.Paper.Scrapbook! I absolutely love this blog and magazine. I've been a follower for awhile now and am constantly inspired by all the talent they feature! "Life. Paper. Scrapbook is an Australian quarterly, online publication that is dedicated to showcasing designers from all around the world to inspire each other, explore current trends and techniques and most importantly to celebrate our love of scrapbooking and paper crafts. This is a place to share our style, designs and creations with like minded crafters from around the world." I will be sharing pages I design for them regularly on this blog, as well as on the Life.Paper.Scrapbook. blog! I highly encourage you to follow their blog if you aren't already. Check out their online magazine too! I loved the first two issues so much and can't wait for the third. I'm so excited for this opportunity and I appreciate you joining me in this journey! PS: To celebrate, I decided at 10 pm one night this week that a blog redesign was in order. My wonderful husband helped me until well past our bedtimes. What do you think? Congratulations Allie! That is fantastic news and so well deserved. Your work is awesome! Love your new look blog too! I'm so proud of you! You've finally been recognized for how talented you are and I couldn't be happier! I love you honey! congrats! love your blog design..
Allie, this is SO amazing!!! I know I already said this on facebook but I am increadibly proud of you and you are so talented! Amazing look on the blog and a BIG CONGRATS! Job well done, I've always enjoyed seeing your layouts! Congratulations Allie!! I'm so proud of you! I love all your beautiful layouts and can't wait to see more from you!! Way to go!